The Yellowstone coyotes were living large in Yellowstone National Park for nearly a century. But after wolf reintroduction it became a different reality for the coyote. The exponential growth of the wolf population has been a bane for the former big dog of Yellowstone. The previously abundant coyotes have dropped off fifty percent from pre-wolf years. For some animals, this can be good news. Pronghorn antelope fawns, for instance, are frequent prey of coyotes. Anecdotal evidence so far is showing that Yellowstone's pronghorn population is doing better, with better fawn survival where wolves are present to keep coyote populations down. 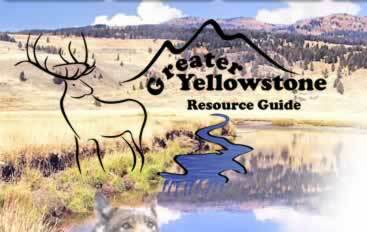 Yellowstone's coyotes are the largest in the United States; adults average about 30 lbs. and some weigh around 40 lbs. They are less than two feet tall and vary in color from gray to tan with sometimes a reddish tint to its coat. Coyotes live an average of about 6 years. Their ears and nose appear long and pointed, especially in relation to the size of its head. It can generally be distinguished from its much larger relative, the gray wolf, by its overall slight, spindly legs, bushy tail and bottle nose compared to the massive 80 to 130-pound stockiness of the wolf. The coyote is a common predator in the park, often seen alone or in packs, traveling through the Yellowstone’s wide-open valleys hunting small mammals. 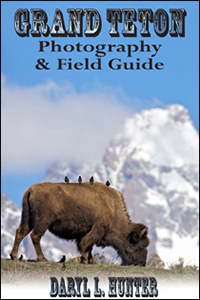 But, they are widely distributed and their sign can also be found in the forests and thermal areas throughout Yellowstone. They are the most vocal of all North American wild mammals, using 3 distinct calls (squeak, distress call and howl call) that consist of a quick series of yelps, followed by a falsetto howl. 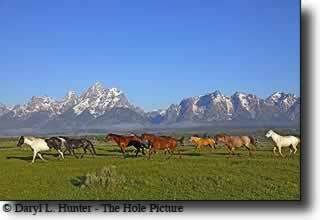 They are capable of killing large prey, especially when they cooperatively hunt. 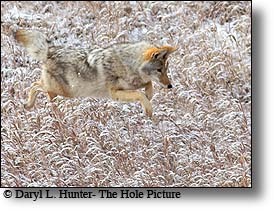 Coyotes are capable of running at speeds up to 40 miles per hour and they can jump distances of up to 13 feet. Coyotes use auditory, visual, olfactory and tactile signals to communicate. They are also consummate scavengers and do their part to clean up carcasses wherever they find them. Once I saw a deer running like crazy and I thought a mountain lion was chasing her but to my surprise it was a coyote. 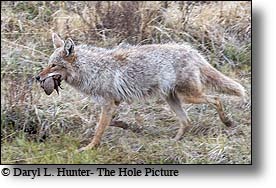 Coyotes are versatile in their eating habits and eat just about anything. They are essentially carnivorous; 90% of their diet is mammalian. They occasionally eat birds and snakes. They prefer fresh meat, but they consume large amounts of carrion. Although they are capable of digging their own burrows, they will often find then enlarge the burrow of marmots or badgers. Dens are used year after year. There are several entrances to a single den. 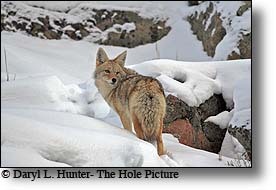 Coyotes leave their dens to defecate and urinate. Coyote courtship lasts for 2 to 3 months. 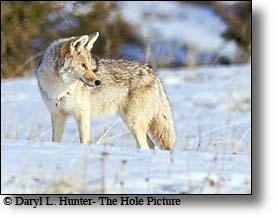 The female coyote has one estrous cycle per year and is in heat for 2 to 5 days between late January and late March. Gestation lasts from 60 to 63 days. Litter size ranges from 1 to 19 pups; the average is 6. Once the female chooses a partner, the mates may remain paired for a number of years, but not necessarily for life. The pups weigh approximately 9 ounces. The young are born blind, limp-eared and pug-nosed. After 10 days the eyes open, the pups weigh nearly a pound and a half and their ears begin to erect in true coyote fashion. Twenty-one to 28 days after birth, the young begin to emerge from the den and by 35 days they are fully weaned. They are fed regurgitated food by both parents. The male pups disperse from the dens between months 6 and 9, while the females usually stay with the parents and form the basis of the pack. Adult size is reached between 9 and 12 months. Sexual maturity is reached by 12 months. The coyote is a species of canine found throughout North and Central America, ranging from Panama in the south, north through Mexico, the United States and Canada. It occurs as far north as Alaska and all but the northernmost portions of Canada. There are currently 19 recognized subspecies, with 16 in Canada, Mexico, and the United States, and three in Central America. Unlike its cousin the Gray Wolf, which is Eurasian in origin, the coyote evolved in North America during the Pleistocene epoch 1.81 million years ago alongside the Wolf. Unlike the wolf, the coyote's range has greatly expanded in the wake of human civilization, once only found west of the Mississippi they are now everywhere including our cities where they seem to thrive. The name coyote is borrowed from Mexican Spanish, ultimately derived from the Nahuatl (traditionally called "Aztecan") word cóyotl. Its scientific name, Canis latrans, means, "barking dog" in Latin. Preliminary genetic evidence, however, has shown that "coyotes" in some areas are, genetically speaking, 85-90 percent Canis latrans, and from ten to fifteen percent Canis lupus (primarily wolf, along with some domestic dog DNA), prompting one researcher to jokingly suggest they be called "Canis soupus" as they are a "soup" (mixture) of canid species.